I’ve been teasing my master bedroom reveal for a few weeks now on Instastories, I couldn’t wait and it was fun showing a little of the behind-the-scenes action. 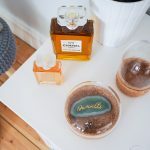 Revamping the bedroom has been high on my list of things to do with our ‘forever house’ since we moved in over a year ago, but it has taken that long to get round to this room, and I’m so happy with how it has all come together, it has definitely been worth the wait. We’re lucky, the master bedroom is quite big, it has lots of gorgeous natural light as it has windows on both sides of the room, and it has some stunning features like the old beams and fireplace. 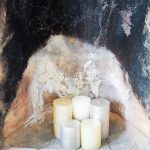 So there was lots to work with, however, the way it had been decorated before with a dull beige colour on the walls and a horrid carpet – it wasn’t inviting to relax in, neither mind getting a decent night’s sleep, so it really did feel like we had to start from scratch. First thing was deciding on colours, over the years at other houses we have had blue, yellow and even white as the main colours in our bedroom, this time we wanted something a little different, a little bolder and more fun, while still working with the old features of the house, and that’s when we decided we wanted a tropical paradise feel to the room – and that all really started with that vibrant feature wall colour we fell in love with and the stunning palm leaf posters on Desenio. Artwork really makes a difference to any room, before, our bedroom didn’t have anything up on the wall, not even a mirror, which just sat against the wall on the floor, as we never got round to it as we didn’t see the point until we had chance to revamp it all. But it is surprising how much of an impact a gallery wall can make, and I’m in love with how the Desenio palm leaf series of posters look on the Proud Peacock green wall. The palm leaf prints we chose really have everything we were looking for, bold silhouettes, a pop of pink, as I love pink with green, as well as a tropical vibe, and I think they look so good grouped together like this. 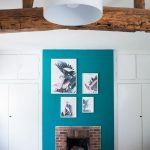 I went for a large print, two mediums and a small as I didn’t want the gallery wall to take up all the room on the feature wall above the fireplace, as I still wanted the bold colour we love to shine through as well. That’s what I find a gallery wall is about creating a balance, not just in the picture choice but also sizing and layout. 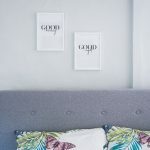 For the bed wall we decided to keep the tropical feel going with a softer palm tree print, as well as the quirky typeface prints with Good Morning and Good Night. 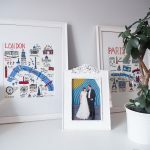 The difference of just adding seven pictures up is unbelievable and all for under £150 pounds, including the frames, which are also from Desenio and I love them – super lightweight and perfect for framing the posters. 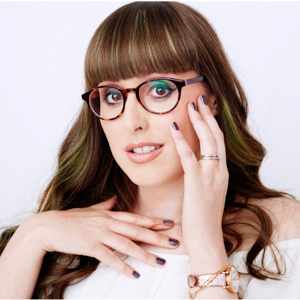 The code “fashionistabarbieuk” gives 25% off posters* at Desenio between August 28 – 30, 2018. The biggest change in the bedroom and the most expensive was the floor, bringing it back to its former glory. We didn’t do this ourselves we got the professionals in as we also had the snug, my office, and one of the guest rooms (full reveals of each room to come) done so it turned out to be a big job. Our house is quite old as well as being a listed building so we want to ensure that it is restore to the best of our ability and the floors needed a lot of work – but so worth it as look how beautiful this floor looks now. When it had carpet down it felt small, now the golden hue of the floor really adds character as well as space to the room and looks beautiful against the statement wall and white furniture, I like the contrast of the old with the modern tropical touches. For the walls we worked around the Dulux Feature Wall Proud Peacock green hue, which was one of five colours we tested, but it won out as I really thought it added a serene but colourful touch to the bedroom, and it worked perfectly with all the white woodwork. The main walls are Dulux Once Polished Pebble, a really lovely light grey that has a shimmer to it in person that looks great with the white furniture we already had and the new grey bed we had ordered. 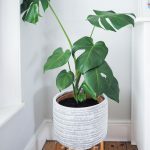 You can’t have a tropical themed bedroom without plants, and I don’t think any bedroom is complete without plants, and it was lovely picking out some of my favourites including the Monstera Deliciosa aka Swiss Cheese plant, it is a beauty and I’ve put him a lovely pot stand that I picked up at TK Maxx for less than £20. I love TK Maxx for plant pots and stands, the only thing is you have to buy when you see as you can never tell how long they will be available for. I’ve also added smaller plants dotted around the bedroom on our bedside tables and top of the larger chest of drawers. But what I love about plants is it is always a work in progress, adding to the botanical vibe takes time and I can’t wait to add more. 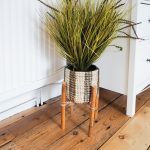 As well as real plants I’ve become a lover of great quality fakes, I’ve got a whole blog post coming on this in the next few weeks, but I found this grass variety fake at TK Maxx with the stand for £14.99 and I couldn’t say no, I just wish I had bought the second one I’d saw for the guest room. 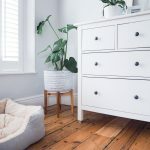 We were lucky with our white furniture as we had it all when we moved in – it is the Hemnes collection – we have the 8 Drawers, the 3 Drawers and the 2 Drawers, which we use as bedside tables. The only thing we changed was the bed, I’ve been looking for a grey bed with storage underneath for a while, we had a faux leather one before and Falcon as a puppy had nibbled all the corners so it had to be replaced anyway. 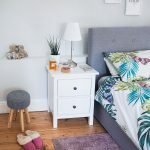 I found one I loved for £1,500 and I nearly cried – just for the bed that’s crazy money – and then by sheer luck I found this one for just over £200 on a bed outlet website, which is part of Dunelm. So, when you’ve found the bed style you want google it, you never know you might find a near identical one for a fraction of the price. 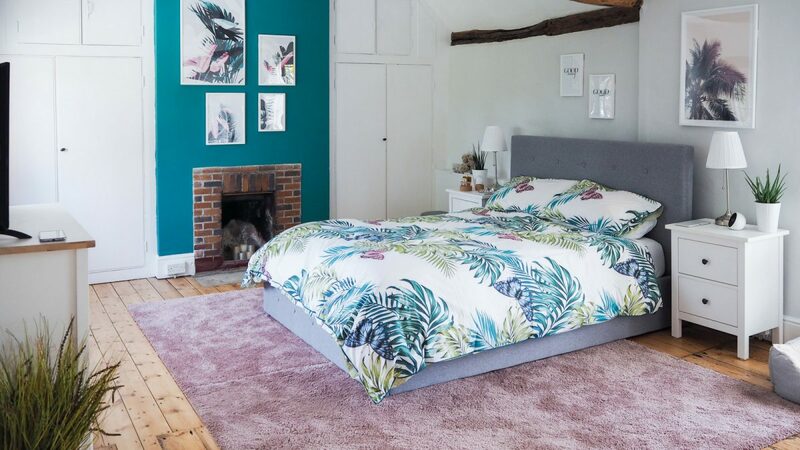 The last final touch of any bedroom is the duvet cover and I found the perfect one in Sainsbury’s, the Palm House Leaf Butterfly Print, which was apparently inspired by Miami, so perfect for our tropical theme. There are a lot of palm leaf duvet covers, I know that Primark has one and Aldi did one, so hunt around for the one that works for you. I went for this one as it had more white space on than the others, plus I liked the pink butterfly touches and the fact it is reversible as it has a light green print on the back. What do you think of my tropical themed bedroom makeover? 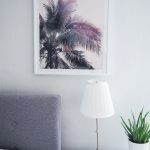 This post was written in collaboration with Desenio but all images and opinions are my own and I chose each and every print that graces my bedroom wall and love them!